I can’t remember how I ran into Recreational Conflict. 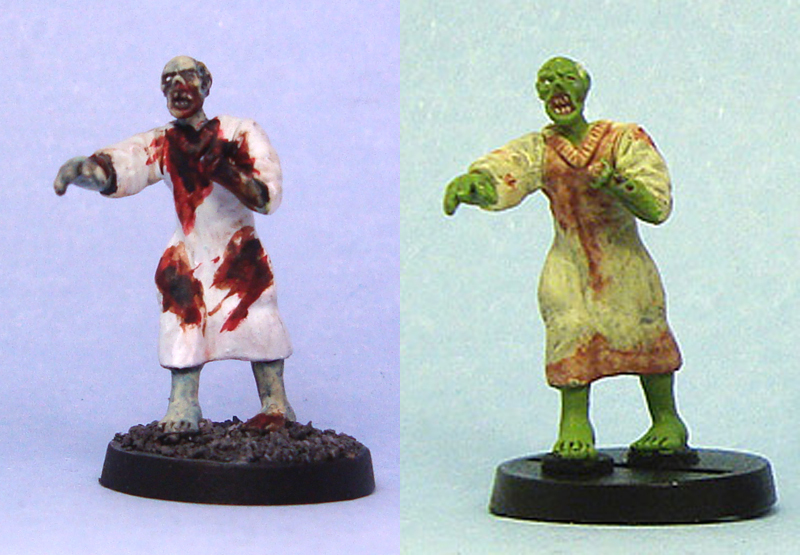 Maybe they were listed in some forum discussion, maybe I was just googling for zombie miniatures, I’ve no idea. However, I’m happy I did. 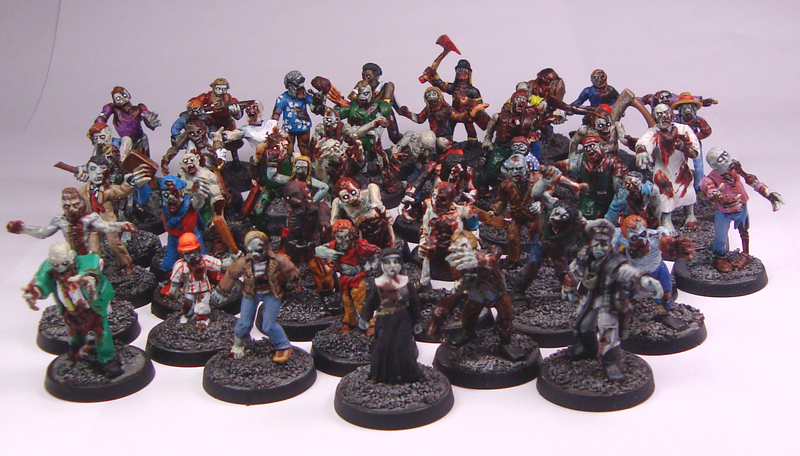 The last few weeks have been pure zombie miniature goodness for me. Not only did I buy the Studio Miniatures zombies which probably are the best on the market (for reviews, see here and here, they already said the same things I would), but followed it up with Recreational Conflicts’ miniatures which aren’t far behind. 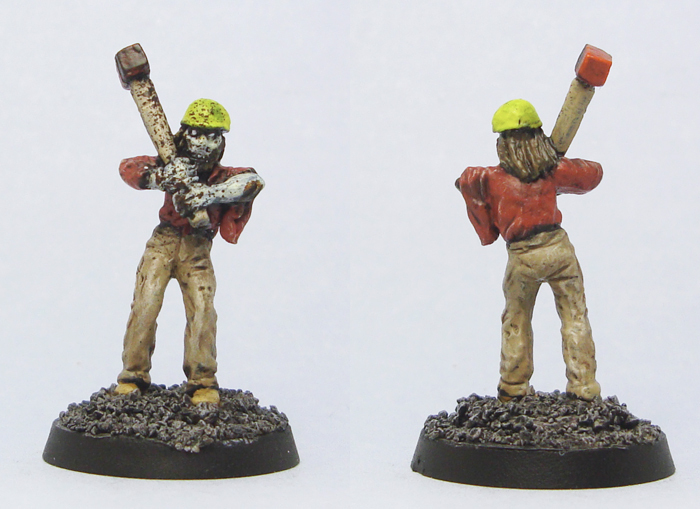 Recreational Conflict sells 8 different zombies in their Lead Bones range, all of them sculpted by Brian Cooke. 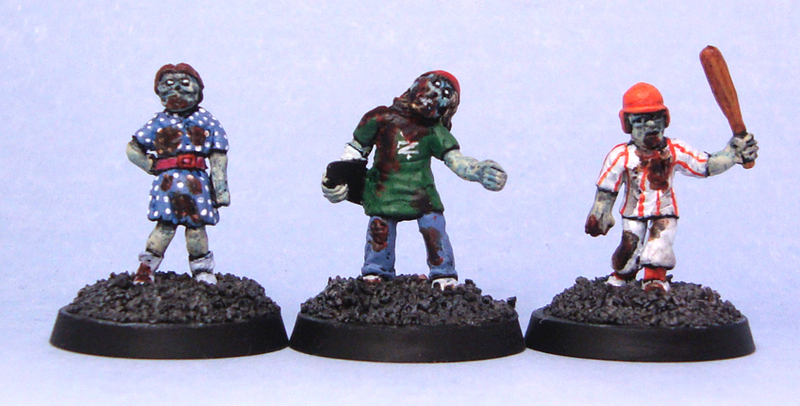 The models span a wide range of concepts, and will add a nice touch of variety to your zombie horde. 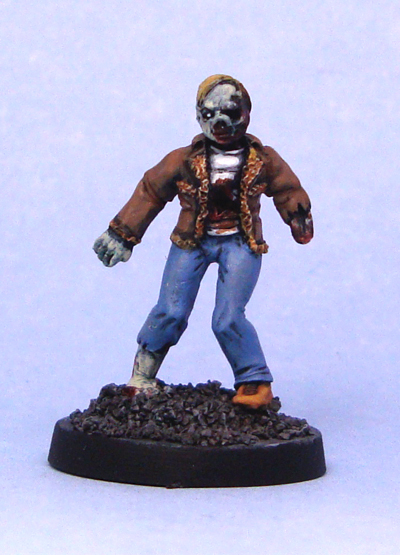 Model #1 – Chewed Up Shambler is a fairly generic modern male zombie. He has a warm looking fur-lined jacket on and has not only lost one of his shoes, but his left arm from the elbow down as well. There’s a large chunk of meat missing from his chest, exposing the ribcage. There’s a bullet hole in his back as a nice detail. The model’s face is very skeletal, which I think lets an otherwise lovely model down a bit as there’s no expression on his face. The face is well sculpted, though! Model #2 – She Was The Sherrif is again really what the name tag says, a female police officer. The model is fine, if a bit boring pose- and face-wise. Bonus points for the empty gun holster and elegant damage, as the poor lady has had her throat torn out some. This one might be the weakest of the 8, though, simply for the bore aspect. 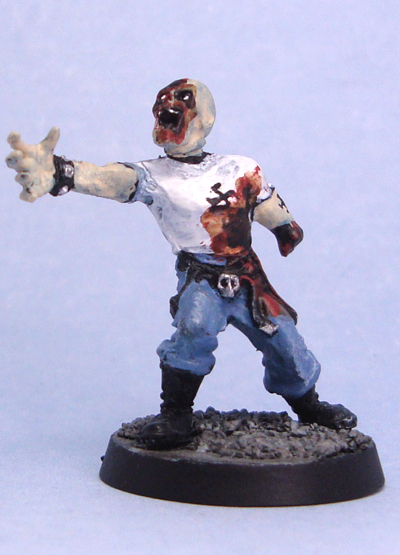 Model #3 – Skewered Vicar is my favourite of all the RC zombies. As the name suggests, he’s a priestly type who has had a large grave marker sized cross rammed through his chest. Apart from that he’s not really sporting other injuries. The vicar is set in a wonderfully vacant and casual zombie pose. The model comes with a hole through the chest and a separate cross. A tiny bit of filing was required to fit the cross in the hole, but the amount of work was minimal. Model #4 – Chopper/The Beard is a biker type, wearing a Prussian spiked helmet (with a massive spike!) and sunglasses in addition to his normal clothes. This model baffles me a bit. 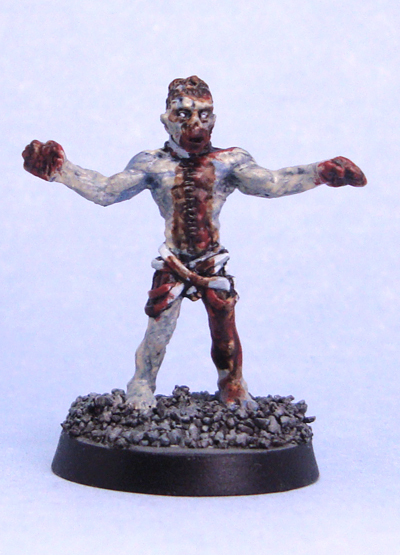 The pose is a bit awkward, which can be explained through zombieness, but the lack of damage and other zombie features make this model a potential survivor as well. There are three teeny tiny holes in his back and two in his front which I assume are bullet holes. However, there is no corresponding damage on the other side, and the holes are small indeed. That leaves this model in a bit of a limbo, as it isn’t really very zombie-like, and the awkward pose eats from his suitability as a survivor. 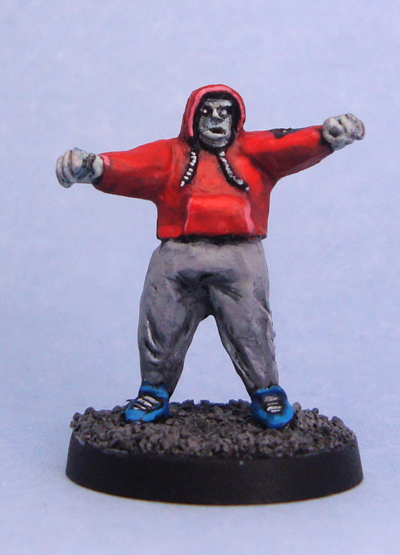 The only skin visible is on his hands, his nose and his cheeks, so he isn’t really easy to zombify by painting either. He competes with #2 for the title of weakest mini. Model #5 – Sharkbait is a different story altogether. 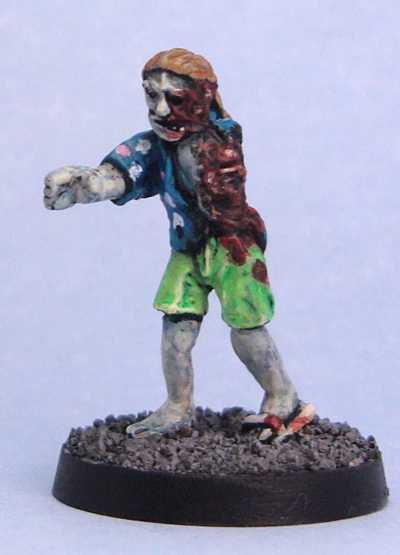 A gruesome zombie surfer in a pair of shorts, with the entire left half of his upper body missing and what’s left of his ribcage showing. For further evidence of his demise Sharkbait carries what’s left of his half-eaten surfboard. He still has his ankle strap, used to keep a surfer’s board from straying too far if he falls over, on. The remains of the strap are hanging from the board’s end. This kind of loving attention to small detail really makes for a nice mini. 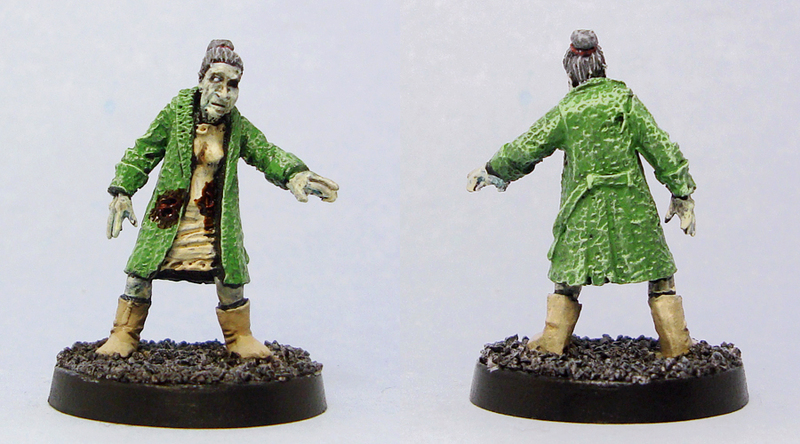 Model #6 – Sister Mary is a zombie nun, which we can never have too many. She’s a lovely sculpt with a torn habit which shows that one of her impressively large breasts has been torn off exposing the ribs. She wears her rosary beads and crucifix around her waist. 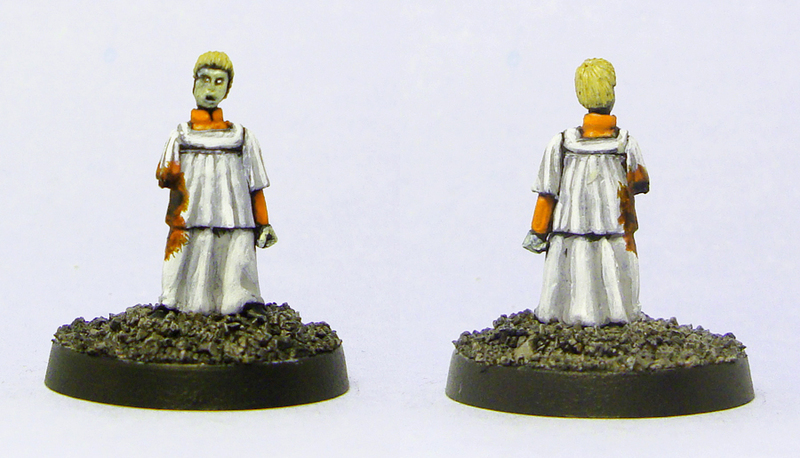 Model #7 – Altar Boy adds to the too-slowly growing number of zombie children miniatures available. The sculpt is simple and flat, with the only damage being a missing right arm. Come to think of it, I don’t think I’ve seen a zombie kid sporting a lot of damage. Maybe it’s just the size of the sculpt, or is the subject still a bit taboo? This little altar boy combined with the nun and vicar above should be proof enough that religion simply won’t keep you from being eaten by the undead. 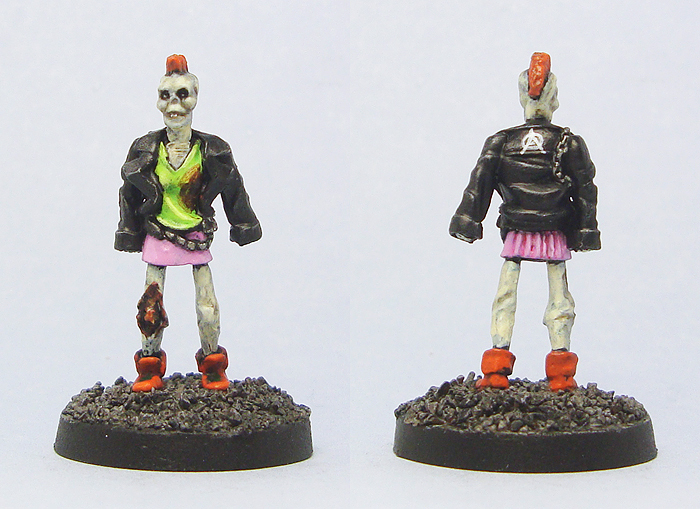 Model #8 – Thin Lizzy is a thin punk rocker zombie girl wearing an oversized – her boyfriend’s, maybe? – leather jacket, a miniskirt and a pair of combat boots. The model is very tall, the size of Sharkbait and standing half a head taller than Sister Mary. The sculpting is nice, with chains hanging from both her belt and her leather jacket and a mohawk hairdo on her head. Oddly enough the skirt only has fold on the backside and not on the front. Could be a fashion thing, can’t really tell. As with model #1, I feel that this model is let down by her skeletal head, which is basically just a skull. Yes, a skull with a mohawk on top. All the comments that apply to #1 apply here as well. Still, I like her! 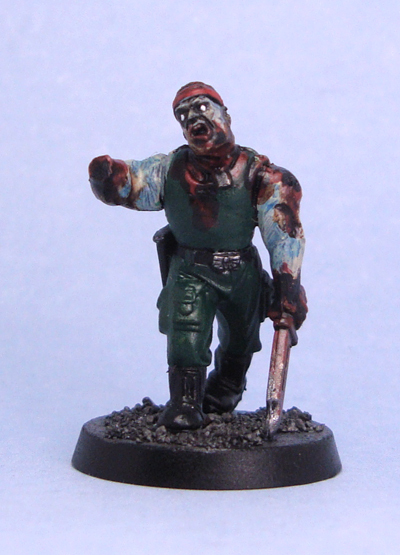 The overall quality of the RC zombies is excellent. They are crisp, clean sculpts and quality casts with next to no flash. 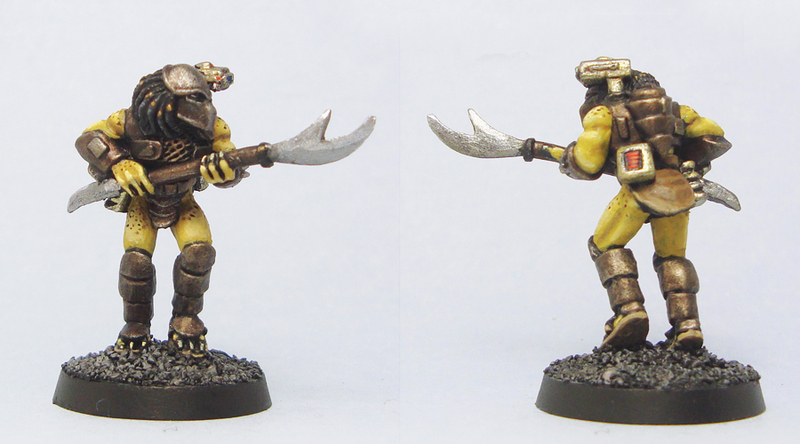 A few models had some tiny moldlines to scrape off, but other than that they were fine out of the box. The zombies are set on cast round bases. I liked the variety of the sculpts, as well as the nice gender distribution. Three of the eight miniatures were female, one of the five males was a child. There were some nice specialties to stand out from your horde, namely the clerical types, the surfer, the biker and the punk rocker and the cop…basically everyone apart from #1. Sizewise the models fit perfectly with other 28mm manufacturers, being of average build. See the size comparison below for reference. You can buy the models separately at the price of $2.50 each, or in sets of four for the price of $10, amounting to…waaaait a minute, $2.50 each! Funnily enough, I didn’t even notice this while ordering. While this doesn’t offer you a discount, neither are you stuck with having to buy minis you don’t want to save money on individuals. Shipping costs are very reasonable, too, with overseas shipping for the eight miniatures being only $5.00. For comparison purposes, many US companies charge ~$20 for a similar order, effectively doubling the price of the miniatures. 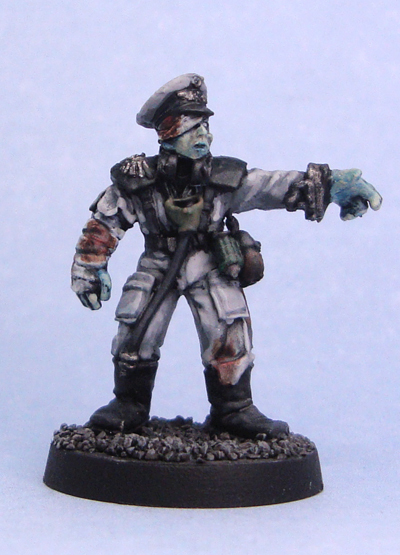 Overall verdict: I would definitely recommend Recreational Conflict’s zombies to everyone looking to add quality to their 28mm horde. They are fine minis, and have made me consider buying some of RC’s S.P.R.U. agents to fight them. The miniatures are available directly from Recreational Conflict.